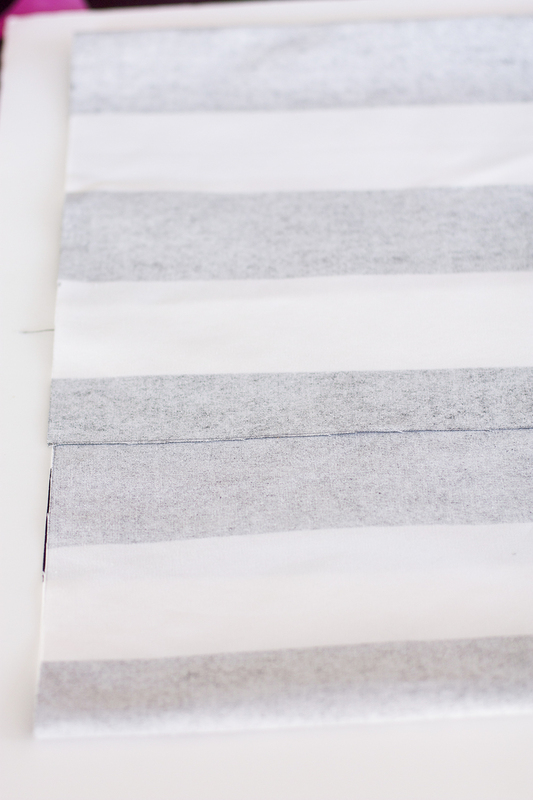 Measure out your fabric to 16.5" x 38." Mark the halfway point in your pillow. I measured my pillow to 36," but I recommend 38," so the halfway point would be 19." Print and cut out the heart template (link in supplies). Tape pieces of heart template together. Trace and cut heart onto iron on vinyl. Warm the halfway spot you marked on the fabric with an iron on the high setting (no steam). Lay heart down on the fabric, plastic liner side up. With medium pressure, warm the heart (lol ;-) for 25-30 seconds with the iron. Continue around the heart in the same way until the entire heart has been warmed. Flip fabric over and do the same thing on the other side. Let cool and peel off plastic liner. Sew the short ends of the fabric inside out leaving a 1/2 inch seam. With the fabric inside out, overlap the ends of the pillow so the heart is centered on the pillow and the pillow measures 16.5." Pin the pillow together (one pin on each side will do). Sew around the entire pillow while folded leaving a 1/2" seam. (Note: The pillow inserts are 16 x 16; however, I have noticed sewing down the fabric to size 15.5 x 15.5 creates a more fitted cover for the pillow). I like to go in reverse over the corners to reinforce them. Check out your sewing machine's manual for this setting. Turn the pillow cover right side out and stuff your pillow with the insert. Voila! Don't you think this would be cute for Valentine's Day breakfast in bed? Any other fun ideas you think these would be cute for? You know I always love hearing from you in the comments!